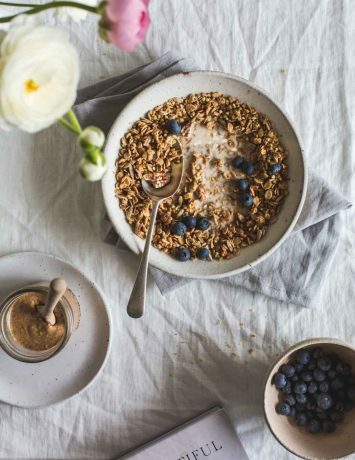 Just a little bit different, this wonderfully chunky toasted sesame granola is filled with the goodness of rolled oats, nuts and seeds combined with the distinctive flavour of toasted sesame. I am always promising the Husband I will whip up some tasty homemade granola for him but until now have been a bit lax in my wifely granola duties. I have made it a few times but to be honest I have been taking the easy route and buying ours. Given that the he eats it every morning it has been an expensive little exercise. Good quality muesli and granola is not cheap. 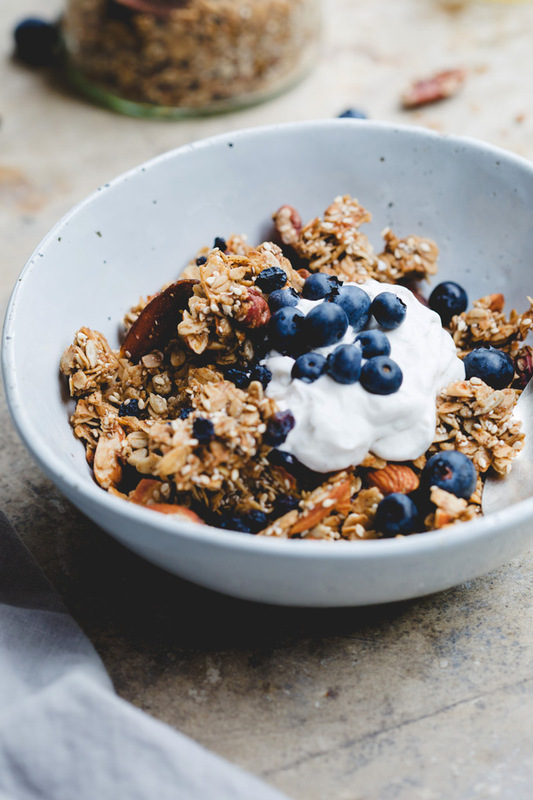 Having said that, neither are the ingredients for this wonderfully chunky toasted sesame granola but the difference is we will get many batches from the ingredients we bought. The Husband gets around fives serves from the packet we buy and he’ll get around the same from the batch I made, however we’ll get another two or three batches from the ingredients. We’ll end up just ahead once the ingredients are used. The beauty of making your own is that on weeks when you’re a bit cash-poor, you can cut out the more expensive ingredients. When things are more flush, buy ingredients in bulk. 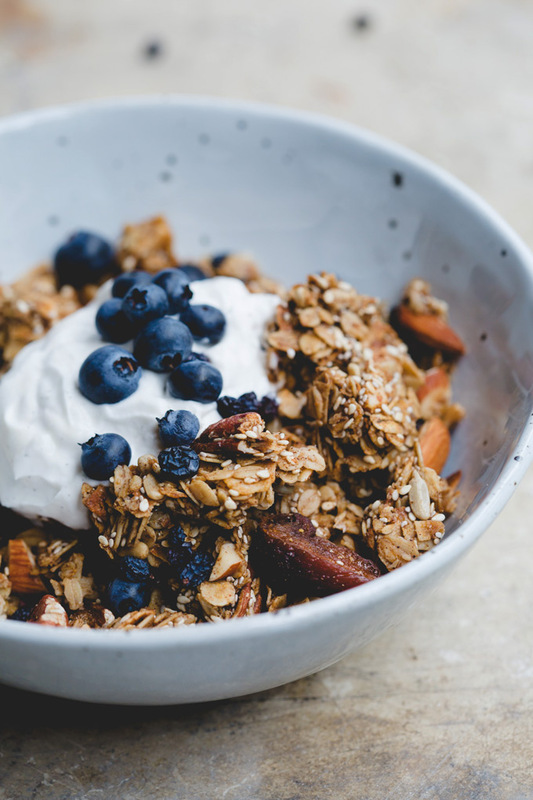 Making your own granola also means you can regulate your sugar and fat content with breakfast foods being notoriously high in both. 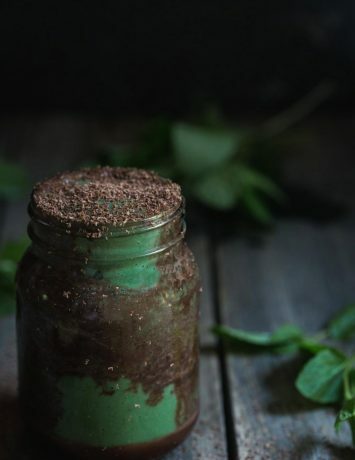 Best of all you can create your own flavours deviating from the typical shelf varieties. 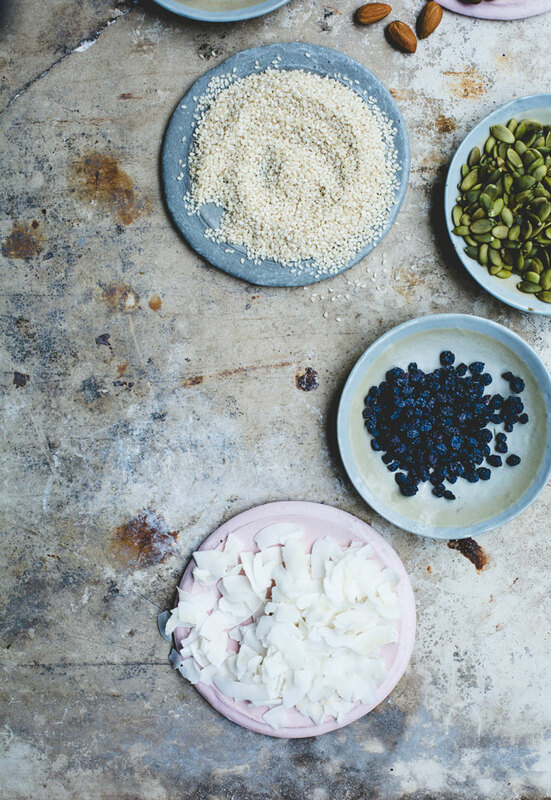 This wonderfully chunky toasted sesame granola has become my current food obsession. A few months ago I posted a za’atar-spiced pizza recipe and while I was toasting sesame seeds for the spice mix I imagined so many sweet uses for the little seeds. Toasting sesame seeds gives them a sweet nutty flavour that is distinctive and a little exotic. 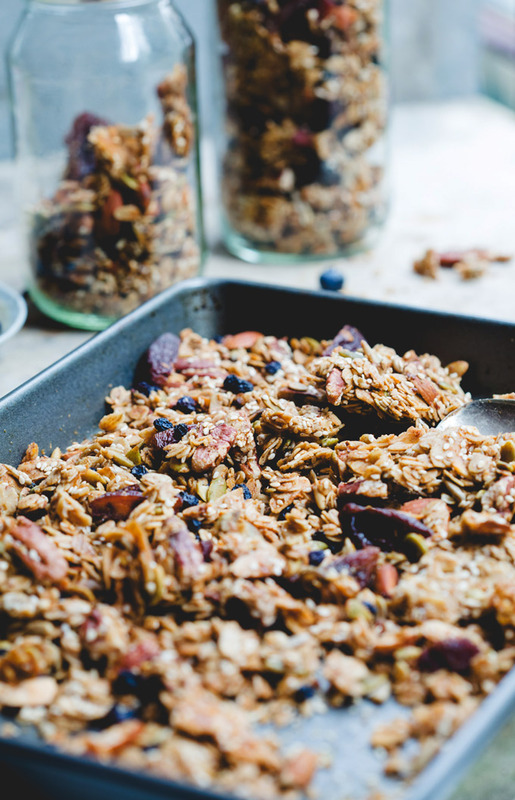 It was a no-brainer adding them to this granola recipe. Combined with toasted coconut flakes, ground cinnamon, maple syrup, mixed seeds, almonds, pecans and dried apricots and cranberries this granola sings. I don’t eat breakfast as the norm – I know mea culpa, mea culpa – but I am a little addicted to this granola. Being so wonderfully chunky I can either sit and eat it with a good dollop of coconut yoghurt and berries or grab a handful on the fly and nosh at my leisure. Adding to my granola induced bliss, the Elf likes it. 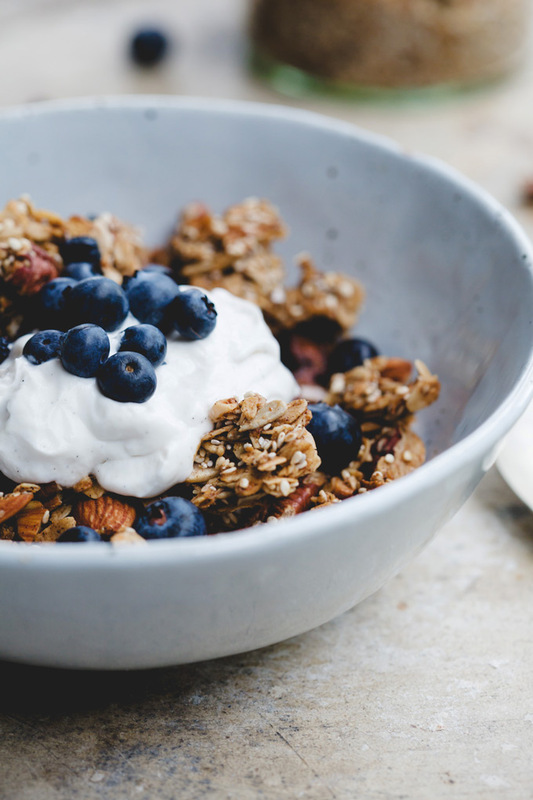 She too is a breakfast naysayer – I know, I know, however in my defence I do make her eat something – but with our wonderfully chunky toasted sesame granola I have not had to resort to cajoling or bribing. A little parenting win. Yay. While making granola is certainly more time-consuming than buying from the store, I think it is time well spent. The aromatics filling the house when the cinnamon, sesame seeds and coconut start toasting is simply intoxicating and thoughts of store-bought waft away. One could get drunk on the barefoot Martha Stewart vibe of it all. The granola costs but that little buzz is free. Enjoy. 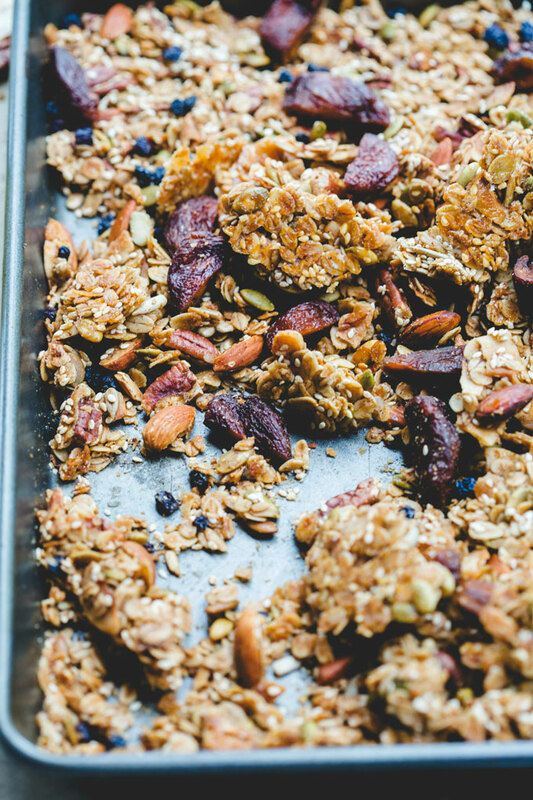 Recipe Note: Resist the urge to stir the granola. If you want chunks, you have to let it sit and do its thing. Just a little bit different, this wonderfully chunky toasted sesame granola is filled with the goodness of oats, nuts and seeds and toasty sesame. 1/3 cup pumpkin or sunflower seeds or both! In a large mixing bowl combine the oats, coconut, cinnamon, seeds, nuts, salt and sugar. Mix. In a small saucepan over medium heat whisk together the maple syrup and coconut oil until they become completely combined. Add vanilla if you are using it and whisk again. Remove from the heat and pour carefully over the granola mixture. Stir well ensuring all ingredients are well coated in the maple mixture. 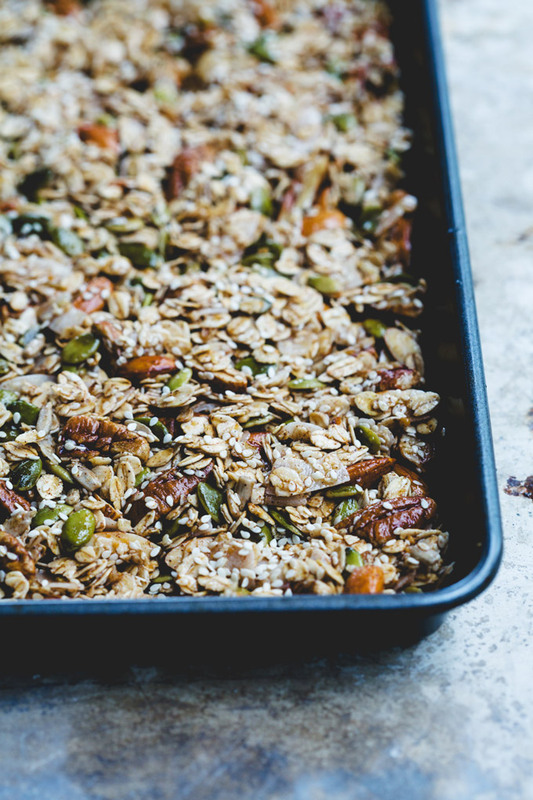 Turn the tray around 180 degrees and bake again for around 15 - 20 minutes but do not stir the granola. Remove from oven and sprinkle the dried fruit over the top. Leave to cool for at least 15 minutes. Do not stir the granola. After 15 minutes using a spatula or large spoon break up the granola in to chunks. That is EVERYTHING a good granola should be! Thanks so much Rebecca! I am so smitten with this granola.